Reflecting on the hundreds of meals I experienced in 2016, a few trends immediately come to mind. I submit my list of dining of must-try dishes and trends for 2017. Happy New Year and Bon Appetit! Thanks to the coconut water craze, flavored water at restaurants offers a new twist. At Pok Pok restaurant in Chinatown, the water is enhanced with a pandanus leaf, giving the water a toasted rice, vanilla and grassy essence. LYFE Kitchen has three refreshing waters that include cucumber mint that is made with fresh cucumber juice, mint, lime and a touch of agave. They also make hibiscus beet water and fresh orange juice with ginger and chia seeds. Pok Pok 978 N. Broadway (213)613-1831. LYFE Kitchen 2746 W. Jefferson Blvd., #2200 (424)353-9003. INTRO Art Gallery & Chefs Table makes the most unique edible dime bags from clear Japanese rice paper that is filled with powdered foie gras, cocoa nibs and puffed rice before being folded into a triangle. True Food Kitchen makes edamame filled handmade dumplings served in a light dashi broth spiked with white truffle oil and sprinkled with sesame seeds and Asian herbs. For INTRO reservations visit www.ExperienceIntro.com, 4200 Lankershim Blvd. True Food Kitchen – 168 W. Colorado Blvd. (626)639-6818; 860 S. Sepulveda Blvd. #100 El Segundo (310)469-7725; 395 Santa Monica Place, Suite 172, Santa Monica (310)593-8300 and 451 Newport Center Drive, Newport Beach (949)644-2400. Baltaire offers roaming caviar carts, salads prepared before your eyes, Champagne carts, and a tableside cheese cart featuring 12 domestic and global selections, plus housemade apple butter, candied walnuts, grapes, and crostini. Le Petit Paris makes flambé Italian pasta with cognac and black winter truffle at your table. It’s prepared on a giant parmesan cheese wheel, as is the cognac-flambéed whole roasted lobster with macaroni. Baltaire – 11647 San Vicente Blvd. (424) 273-1660. Le Petit Paris – 418 S. Spring St. (213)217-4445. Georgie at the Montage Beverly Hills serves a large, beautiful bowl of colorful raw crudités with a Green Goddess dipping sauce. It’s a deconstructed salad with a variety of heirloom farmers market vegetables. 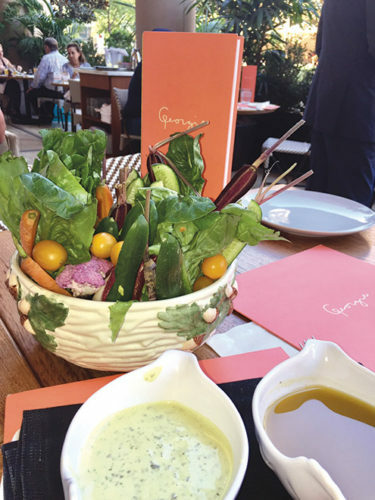 Across the street at CITIZEN, their bowl of fresh crudités is served on ice and arranged in a colorful pattern with an edamame hummus dip. The vegetables included purple and light yellow cauliflower, snap peas, heirloom cherry tomatoes, bright red radishes, yellow and orange carrots, and the slightly nutty green cone romanesco vegetable. Georgie – 225 N. Canon Drive (310)860-7970. CITIZEN – 184 N. Canon Drive. (310)402-5885. Wolfgang Puck CUT Lounge at the Four Seasons Beverly Wilshire Hotel makes this ethereal pate to spread on exquisite dark brown bread. The whipped, smooth chicken liver pate is crusted with honey mustard seeds and decorated with colorful micro flowers. This pairs elegantly with a glass of sparkling rosé wine. The Front Yard makes a PB & J jar. Don’t expect peanut butter. Instead it’s a smooth chicken liver pate blended with crushed hazelnuts. On top is a thick layer of Concord grape jelly. It arrives on a plate with toasted dark brown pumpernickel sliced bread and a cluster of seedless grapes. CUT – 9500 Wilshire Blvd. (310)276-8500. The Front Yard – 4222 Vineland Ave. (818)255-7290. Badmaash’s triangular shaped appetizers stuffed with potatoes and sweet peas are enhanced with coriander seeds, roasted cumin and ginger. The butter chicken samosas are stuffed with flavorful Punjabi curry. Avocado is whipped into their yogurt raita and served with rosemary naan bread. Be sure to finish with a small glass of India’s “cutting chai.” It’s brought to the table in a small, old-fashioned wire milk crate. It tastes just like the hot strong black tea that is cut with milk, sugar, cinnamon, clove, ginger and cardamom that tea street vendors or chai wallahs sell at train stations, alleyways, urban centers and bus depots. Actor Danny Trejo opened two street taco, tostadas, burritos and ceviche destinations in 2016, plus rolled out a food truck. Try the steak asada with toasted pepita pesto and slaw; slow roasted pork with charred pineapple, red onion, cilantro and fermented red chile sauce taco; vegan quinoa tostada or fried chicken burrito wrapped with chipotle cream and pico de gallo. Badmaash – 108 W. 2nd St #104. (213)221-7466. Trejo’s Tacos and Cantina – 1556 N. Cahuenga Ave. (323)461-8226 and 1048 La Brea Ave. (323)938-8226. SPRING makes a bowl of al dente risotto aux champignones made with Italian Carnaroli rice, that is slow cooked with three different types of mushrooms, Parmesan Reggiano and extra virgin olive oil that is whipped into a frothy white sauce to add richness to this dish. Laurel Point makes small cheddar and chive buttermilk biscuits and serves them with a housemade green and red pepper jelly. Pure Southern shrimp and grits can be calorie laden, however at Odys + Penelope, the chefs mince cauliflower to resemble grits and add a slightly buttery paprika sauce before topping with wood fired shrimp. A 70’s throwback served at CITIZEN is pimento cheese dip served with warm rosemary and white cheddar buttermilk biscuits. Drizzle a little chipotle maple syrup on top for added zing. SPRING – 257 S. Spring St., (213) 372-5189; Laurel Point – 12050 Ventura Blvd. Studio City (818)769-6336. Odys + Penelope – 127 S. La Brea Ave. (323)939-1033. CITIZEN – 184 N. Canon Drive. (310)402-5885. The Front Yard’s Executive Chef Larry Greenwood and chef de cuisine Jacob Smith make eating carrots & peas fun. It starts with a butterscotch carrot puree that’s topped with steamed purple, orange and light yellow carrots, peas pods and their tendrils. They also caramelize brussels sprouts with a spoonful of chili sabal sauce, lime, yuzu crushed peanuts and splash of fish sauce. In downtown LA try the stuffed sweet peppers at The Factory Kitchen. The perperu appetizer is made with red sweet peppers filled with with a creamy white cheese, sprinkled with arugula leaves, Grana Padano shavings and arugula oil. The Front Yard – 4222 Vineland Ave. (818)255-7290 and The Factory Kitchen – 1300 Factory Place #101, (213)996-6000. Chef Brandan Collins at Birch slowly cooks large pork shanks and bathes them in a palm sugar glaze until the meat almost falls off the bone. It’s presented on a wood plank with bowls of slightly pickled cucumber, cool shredded carrots and fresh Italian parsley. Guests can enjoy the meat alone or wrap pieces in a crisp lettuce leaf or slices of za’atar bread with cool veggies before topping it with a black garlic hoisin sauce. 1634 N. Cahuenga Blvd., Hollywood (323)960-3369. Live-fire cooking methods are the rage right now to cook prime meats, sustainable seafood, and vegetables. These new wood fired, open flame ovens inspire chefs to create some fabulous charcoal essence dishes. At Kettle Black, executive chef Sydney C. Hunter III slices cauliflower florets and puts it in the pizza oven until slightly black. He pours a warm bagna cauda made with garlic, anchovies, olive oil, and a touch of cream on top. At Kali chef Kevin Meehan makes a delicious charred avocado vegetarian salad. The pizza pies at Pizza Romana are made from fermented Roman style dough that is stretched and baked until the top bubbles and slightly chars from the intense heat. The rest of the crust is golden with a slight crunch. Nearby at Odys + Penelope wood fired beef makes a great sandwich on a Hawaiian-style bun with melted Swiss cheese, grilled onions and a mustard aioli sauce. What makes this dish visually spectacular are the large puffy onion rings stacked on top. Kettle Black – 3705 W. Sunset Blvd. (323)641-3705. Kali – 5722 Melrose Ave. (323)871-4160. Pizza Romana – 615 N. La Brea Ave. (323)939-1148. Odys + Penelope – 127 S. La Brea Ave. (323)939-1033.